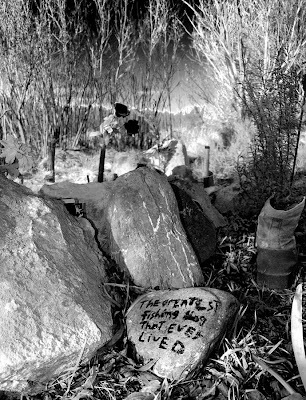 Up on the Lower Owens River, just past the cement plant, is the fishing dog grave. More than fishing, I love dogs-especially those that enjoy adventure as much as I. 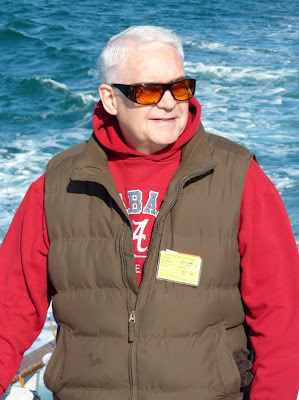 Looking at the old rod seats, wading boots, and dog toys left as offerings, I wondered about all the amazing stories that could be told if one could listen. For as much as any religion has its sacred places, I knew this was spot a cathedral to the bond of fishermen and their K-9 friends. Under the warmth of a winter sun, I enjoyed a nice Sierra Nevada Pale Ale and paid homage to those loyal beasts that had stood alongside their human friends. Mayflies lifted from the cold flowing river like miniature white doves reaching for the azure skies. Only the gurgle of the flowing water stirred the silence and provided an appropriate soundtrack for the place. Kyle and I went up to Bishop this weekend for a boy's adventure. Flyfishing was on tap and as we pulled into the first spot on the river, I had visions of "A River Runs Through It" dancing in my head. Kyle asked if he could put his iTouch on the car stereo, and still in my dreamy state, I said "Sure.." Then, the peace was shattered with Metallica and Social Distortion. Not quite the soundtrack I had in mind, but I couldn't help but appreciate the juxtaposition of it all. The trip was wonderful. Me, Kyle, my buddy Mike and his 2 boys.... We cracked jokes, played pranks, fished, hung out, and had one of those classic father/son weekends. It was just one of those great times. Here's a couple of pics. Remember to click on the photo to enlarge. 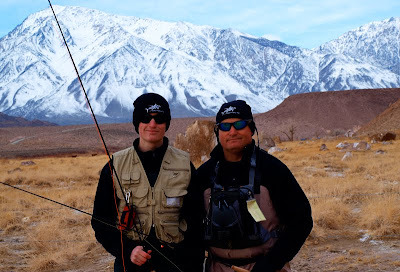 Kyle and I will be heading up to Bishop this next weekend to celebrate Martin Luther King's Birthday as intended by Congress--- Flyfishing on the Owens River. We'll perhaps that wasn't what Congress had in mind, exactly, but the holiday will still provide a platform for us to relax and enjoy a few more Father/son moments while they are available. You see, technology is waging a huge war on the attentions of my son. Whereas the mantra of the 60's was "Tune in, turn on, drop out," nowadays it seems as though it should be "Tune in, turn on, tweet....." He's hooked up to the world. He has a netbook that he can access the world through. He has an itouch that he can get wi-fi on. Heck, he can even play real time games with a kid in Japan on his PS3! 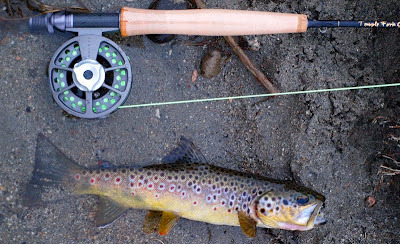 But, when you are out on the river, the fish don't know a tweet from a LOL. They only care about eating and not being eaten. So, he'll have to look around at what the world is doing; Have the insects hatched and can he match them with a fly? Where are the fish hiding so that a high flying eagle or osprey can't swoop them? What is the water doing? If he becomes so detached from the modern world and becomes plugged into nature, he'll do just fine. And, if he's landing a beautiful brown or rainbow with Metallica providing a soundtrack through his earbuds, I can live with that. Photo taken from where we will be fishing, though the Sierra's will have a beautiful mantle of snow. Well, 2009 is in the books and what a tough year it was. We lost my mom to cancer and nearly lost Tami's mom to Valley Fever. There were furloughs and lay-off's at work. Just a tough year. But, there was a lot of good. I reconnected with my Dad and my Sister and her family. I also reconnected with some old friends via Facebook and it really made me appreciate and value the relationships I've had over the years. Most importantly, I've come to understand that life is more important than lifestyles; that living in the moment is better than living for the moment; and that all of it can change in an instant. But, enough of the pondering. We enjoyed an amazing few days down in San Diego at the Loews Coronado Bay Resort, courtesy of an old family friend. Tami suffered through a day at the spa, with a Swedish massage and a treatment involving sugar and coconut milk. 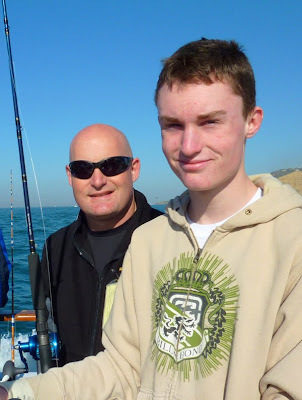 Meanwhile, me, Kyle, and my Dad enjoyed a day out on the bay to break in Kyle's new off-shore rod and reel. 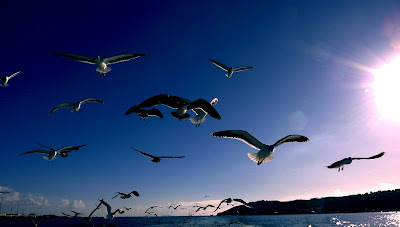 The pic of the sea gulls is my dad's, played with in photoshop. HAPPY NEW YEAR!